Gamete dimorphism (anisogamy) defines the sexes in most multicellular organisms. Theoretical explanations for its maintenance usually emphasize the size-related selection pressures of sperm competition and zygote survival, assuming that fertilization of all eggs precludes selection for phenotypes that enhance fertility. In external fertilizers, however, fertilization is often incomplete due to sperm limitation, and the risk of polyspermy weakens theadvantage of high sperm numbers that is predicted to limit sperm size, allowing alternative selection pressures to target free-swimming sperm. We asked whether egg size and ejaculate size mediate selection on the free-swimming sperm of Galeolaria caespitosa, a marine tubeworm with external fertilization, by comparing relationships between sperm morphology and male fertility across manipulations of egg size and sperm density. Our results suggest that selection pressures exerted by these factors may aid the maintenance of anisogamy in external fertilizers by limiting the adaptive value of larger sperm in the absence of competition. In doing so, our study offers a more complete explanation for the stability of anisogamy across the range of sperm environments typical of this mating system and identifies new potential for the sexes to coevolve via mutual selection pressures exerted by gametes at fertilization. Within species, larger offspring typically out-perform smaller offspring. While the relationship between offspring size and performance is ubiquitous, the cause of this relationship remains elusive. By linking metabolic and life-history theory, we provide a general explanation for why larger offspring perform better than smaller offspring. Using high-throughput respirometry arrays, we link metabolic rate to offspring size in two species of marine bryozoan. We found that metabolism scales allometrically with offspring size in both species: while larger offspring use absolutely more energy than smaller offspring, larger offspring use proportionally less of their maternally derived energy throughout the dependent, non-feeding phase. The increased metabolic efficiency of larger offspring while dependent on maternal investment may explain offspring size effects—larger offspring reach nutritional independence (feed for themselves) with a higher proportion of energy relative to structure than smaller offspring. These findings offer a potentially universal explanation for why larger offspring tend to perform better than smaller offspring but studies on other taxa are needed. The relationship between offspring size and performance determines the optimal trade-off between producing many small offspring or fewer large offspring and the existence of this relationship has become a central tenet of life-history theory. For organisms with multiple life-history stages, the relationship between offspring size and performance is the product of the effects of offspring size in each life-history stage. Marine invertebrates have long been a model system for examining the evolutionary ecology of offspring size, and whilst offspring size effects have been found in several life-history stages, the crucial stage of colonization has received less attention. We examined the effect of offspring size on the settlement response of sea-urchin larvae (Heliocidaris erythrogramma) to preferred and less preferred hostplants, how these effects changed over the larval period and estimated the success of juveniles in the field on preferred and less preferred host plants. We found that smaller larvae became competent to respond to preferred host plant cues sooner than larger larvae but larger larvae rejected less preferred host plants for longer than smaller larvae. Overall, smaller H. erythrogramma larvae are likely to have less dispersal potential and are more likely to settle in less preferred habitats whereas larger larvae appear to have an obligately longer dispersal period but settle in preferred habitats. Our results suggest that marine invertebrates that produce non-feeding larvae may have the potential to affect the dispersal of their offspring in previously unanticipated ways and that offspring size is subject to a complex web of selection across life-history stages. The optimal balance of reproductive effort between offspring size and number depends on the fitness of offspring size in a particular environment. The variable environments offspring experience, both among and within life-history stages, are likely to alter the offspring size/fitness relationship and favor different offspring sizes. Hence, the many environments experienced throughout complex life-histories present mothers with a significant challenge to optimally allocate their reproductive effort. In a marine annelid, we tested the relationship between egg size and performance across multiple life-history stages, including: fertilization, larval development, and post-metamorphosis survival and size in the field. We found evidence of conflicting effects of egg size on performance: larger eggs had higher fertilization under sperm-limited conditions, were slightly faster to develop pre-feeding, and were larger post-metamorphosis; however, smaller eggs had higher fertilization when sperm was abundant, and faster planktonic development; and egg size did not affect post-metamorphic survival. The results indicate that egg size effects are conflicting in H. diramphus depending on the environments within and among life-history stages. We suggest that offspring size in this species may be a compromise between the overall costs and benefits of egg sizes in each stage and that performance in any one stage is not maximized. Offspring size is a trait of fundamental importance that affects the ecology and evolution of a range of organisms. Despite the pervasive impact of offspring size for those offspring, the influence of offspring size on other species in the broader community remains unexplored. Such community-wide effects of offspring size are likely, but they have not been anticipated by theory or explored empirically. For a marine invertebrate community, we manipulated the size and density of offspring of a resident species (Watersipora subtorquata) in the field and examined subsequent community assembly around that resident species. Communities that assembled around larger offspring were denser and less diverse than communities that assembled around smaller offspring. Differences in niche usage by colonies from smaller and larger offspring may be driving these community-level effects. Our results suggest that offspring size is an important but unexplored source of ecological variation and that life-history theory must accommodate the effects of offspring size on com- munity assembly. Life-history theory often assumes that environmental variation drives intra- specific variation in offspring size, and our results show that the converse can also occur. Offspring size is one of the most important life-history traits with consequences for both the ecology and evolution of most organisms. Surprisingly, formal estimates of selection on offspring size are rare, and the degree to which selection (particularly nonlinear selection) varies among environments remains poorly explored. We estimate linear and nonlinear selection on offspring size, module size, and senescence rate for a sessile marine invertebrate in the field under three different intensities of interspecific competition. The intensity of competition strongly modified the strength and form of selection acting on offspring size. We found evidence for differences in nonlinear selection across the three environments. Our results suggest that the fitness returns of a given offspring size depend simultaneously on their environmental context, and on the context of other offspring traits. Offspring size effects can be more pervasive with regards to their influence on the fitness returns of other traits than previously recognized, and we suggest that the evolution of offspring size cannot be understood in isolation from other traits. Overall, variability in the form and strength of selection on offspring size in nature may reduce the efficacy of selection on offspring size and maintain variation in this trait. Biologists have long sought to identify and explain patterns in the diverse array of marine life histories. The most famous speculation about such patterns is Gunnar Thorson’s suggestion that species producing planktonic larvae are rarer at higher latitudes (Thorson’s rule). Although some elements of Thorson’s rule have proven incorrect, other elements remain untested. With a wealth of new life-history data, statistical approaches, and remote-sensing technology, new insights into marine reproduction can be generated. We gathered life-history data for more than 1,000 marine invertebrates and examined patterns in the prevalence of different life histories. Systematic patterns in marine life histories exist at a range of scales, some of which support Thorson, whereas others suggest previously unrecognized relationships between the marine environment and the life histories of marine invertebrates. Overall, marine life histories covary strongly with temperature and local ocean productivity, and different regions should be managed accordingly. An understanding of the effects of intraspecific variation in offspring size is important from both an ecological and an evolutionary perspective. While the relationship between off- spring size and overall offspring performance is key, most studies are restricted to examination of the effects of offspring size on early life-history stages only, and too few have examined the effects of offspring size throughout the life history. 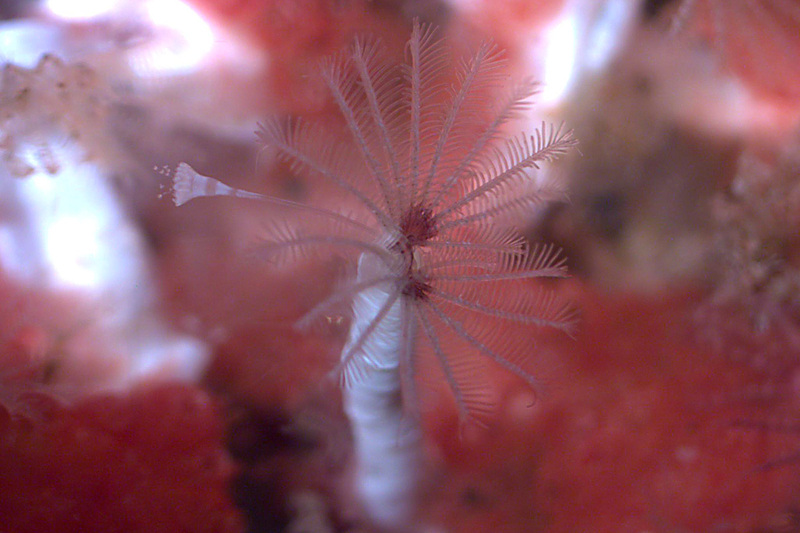 Here, we examine the effects of offspring size on post- metamorphic survival, growth, and fecundity under field conditions for the polychaete Janua sp. Larger offspring became larger adults and had higher levels of fecundity than those from smaller offspring, though the effect on fecundity was weaker and more variable over different experimental runs. Adults derived from larger larvae had shorter lifespans than adults derived from smaller larvae. Our results suggest that the maternal effect of offspring size can influence the frequently observed trade-off between longevity and fecundity. Future studies should seek to measure the effects of offspring size over as much of the life history as possible in order to avoid misestimating the relationship between offspring size and fitness. We work on questions ranging from community ecology through to quantitative genetics. Most of our work focuses on sessile marine invertebrates living in coastal systems — these organisms are extremely amenable to manipulation and can be tracked in the field for extended periods of time. Some of us are interested in traditional marine ecology whereas others are evolutionary biologists who happen to work on marine invertebrates. For related research, see the Centre for Geometric Biology; an interdisciplinary research team changing the way we study, understand and manage natural systems.